I lay awake on my cot, thinking of the weird confluence of past and present afoot in these strange days. 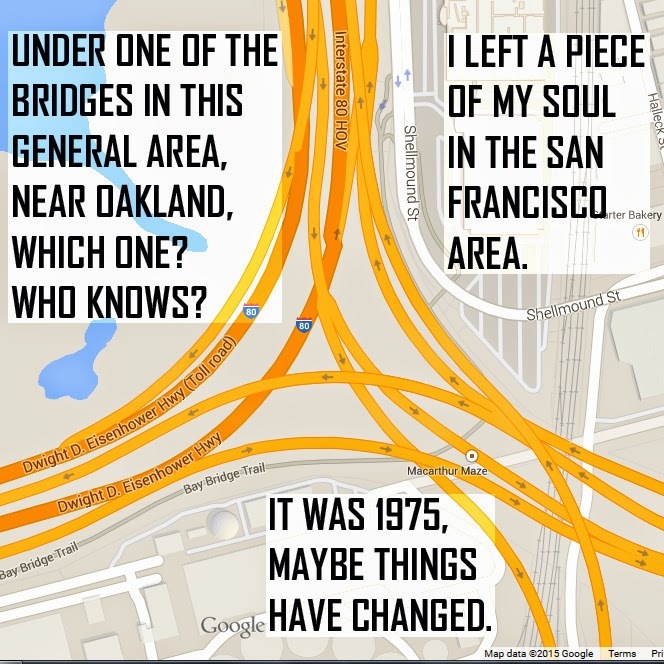 We had narrowed it down to this fact, that the piece of my soul that I'd lost in San Francisco in 1975 was the center of the entire trip. I kept thinking back to my night there, under one of the highways, wondering what the morning would bring. I was hitchhiking out. The soul split was unfortunate, and when morning came, close to 40 years ago, I should've looked for it more diligently. The truth is, I felt a distinct difference, but at that age how would I know how much soul I'd need? Or that decades later I'd have a friend and lover who'd obsess over it to the point of going there? I thought The Pink Professor was the perfect man -- and still do -- but, Get a calculator! Wouldn't it be smarter to stay home and enjoy 93% of my soul than leave to get by with 7%, or however much it was? So I spent that night clinging to my pack and possessions for comfort. And with morning, caught a ride. I spent the next night, a disastrous, cold night, outside Winnemucca, NV, and wasn't myself. I was totally freaked out when I crawled to the middle of a culvert under the highway and imagined scorpions and other animals crossing through there. It left me no choice -- split soul and all -- but to get out and spend the night wrapped in my space blanket, standing by the side of the road. A military general picked me up at daylight and said I looked like his son. He bought me breakfast and gave me $5.00. I have to wonder, if I'd had the rest of my soul, maybe I'd have gotten more. Back to today, I knew at some point the blimp would be near Winnemucca. The memories of the old general are actually sweet ones, though by now he's probably dead, and his son old like me. In other activity -- it wasn't all boring contemplation -- I tried one of the billionaire's other chamber suits -- this one meant to hone your mental acuity in the zero gravity chamber. My vision was sharp, hyper-realistic. I saw The Pink Professor, as in a musical, on his knees like Al Jolson, calling out to me, not "Mammy" but "Babyface!" Behind him was a large group of devotees, also calling out. I saw an underground shrine and a whole apparatus of devotion and sacrifice. The Pink Professor counseled two old derelicts, who were given an honored place in his group, the "Servants of the Beloved," the "Beloved" apparently being him, me, or 7% of my soul. I shuddered and left the chamber. Because if one broken off soul shard is so important, I don't want to lose any more.